I try to make stock whenever there are bones available. My favourite is turkey stock: it seems to work with any meat and always makes a terrific gravy. Trouble begins when I try to store it. 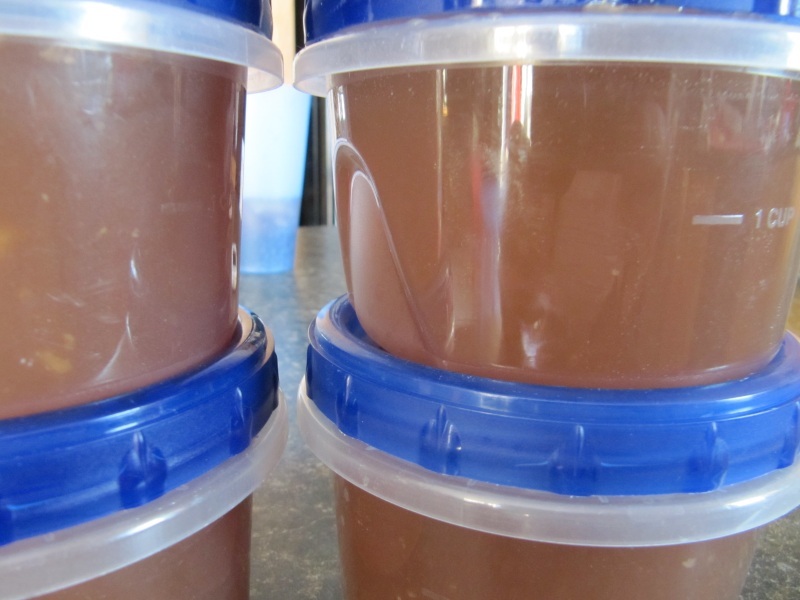 Large quantities are the norm: if you’re going to the effort of making stock then make a lot. I used to freeze two cups of stock in a Ziploc bag which worked great and as stacked flat they freeze well. Unfortunately defrosting it was an issue: I had to put the bag in a bowl since it would invariably leak and certainly couldn’t microwave it. Rummaging around our cupboards brought me into contact with our large pile of Ziploc Twist ‘N Loc containers. The small holds two cups, freezes well, stack and organize easily and defrost wonderfully: my new go to stock container.